Profile Boats’ recent successes at the Hutchwilco New Zealand Boat Show have cemented the brand as a serious player in the aluminium pontoon market and a worthy rival of larger manufacturers in the pontoon class. 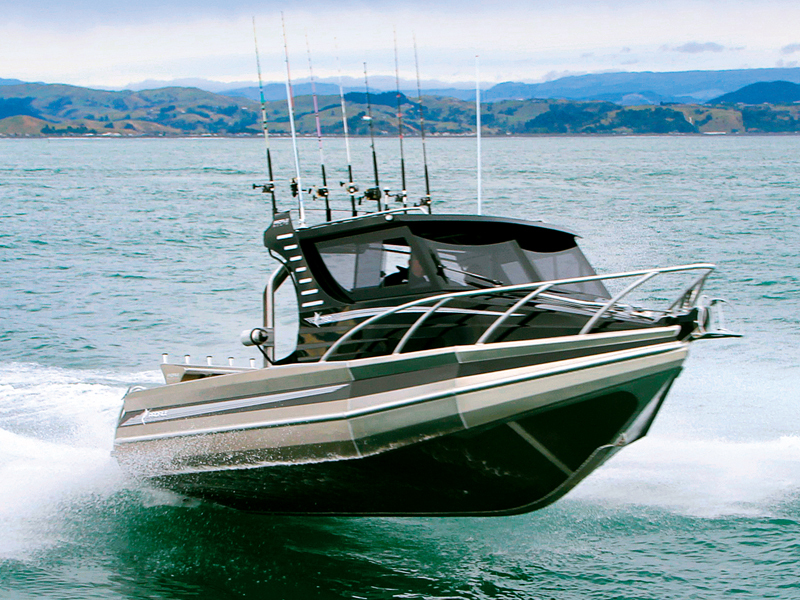 Purchased outright in 2008 by Napier-based Firmans Marine, Profile Boats has experienced rapid growth in production on the back of serious investment, including a purpose-built factory employing 13 fabricators across eight production bays. It is a slick operation and it is about to get better with a 200m2 factory expansion to provide dedicated fit-out bays. This will facilitate end-to-end production from a single site and deliver efficiencies that will enable Profile Boats to increase its build numbers while slashing build times. Profile Boats owner and managing director Brian Firman says that while the mid-term strategy is to push into the Australian export market, for the time being the company’s immediate priority is to get on top of the demand curve in New Zealand. "The bottom line is we can’t build boats fast enough and that’s costing us business," Firman said. "We’ve rarely got stock models on our showroom floor. Everything we sell is pre-ordered and the lead time on our mid-range models needs to come back." At the upper end of Profile Boats semi-production range, the 780HW is a versatile boat that lends itself equally to recreational and commercial applications. It is a big rig, engineered and designed to provide a robust platform capable of operating safely and comfortably well offshore. The 780HW is available in a broad range of configurations and on top of that they tend to be highly customised to suit each owner’s particular requirements. One big choice is between an enclosed lock-up hardtop or the open hardtop seen here. 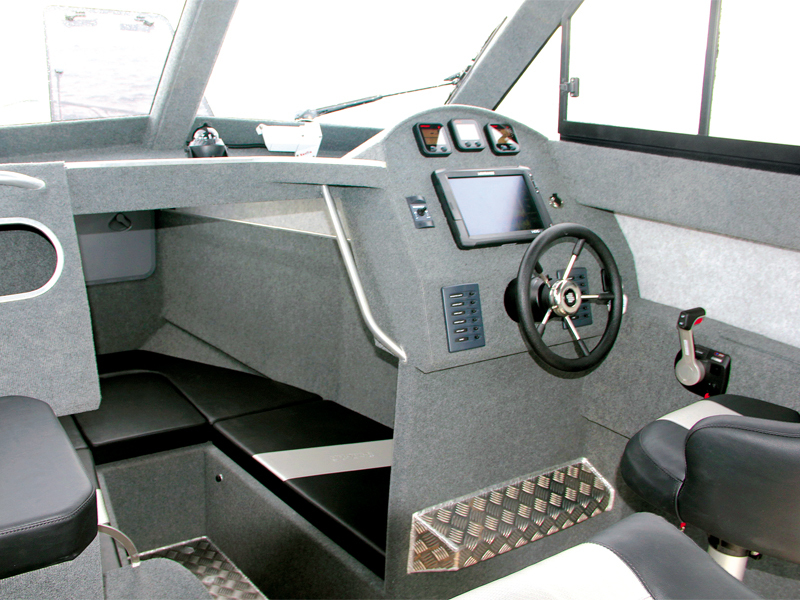 Both options have their advantages but it is the open model that provides the most advantageous use of space, broader seating configurations and an easy flow from cockpit to helm station and cabin. 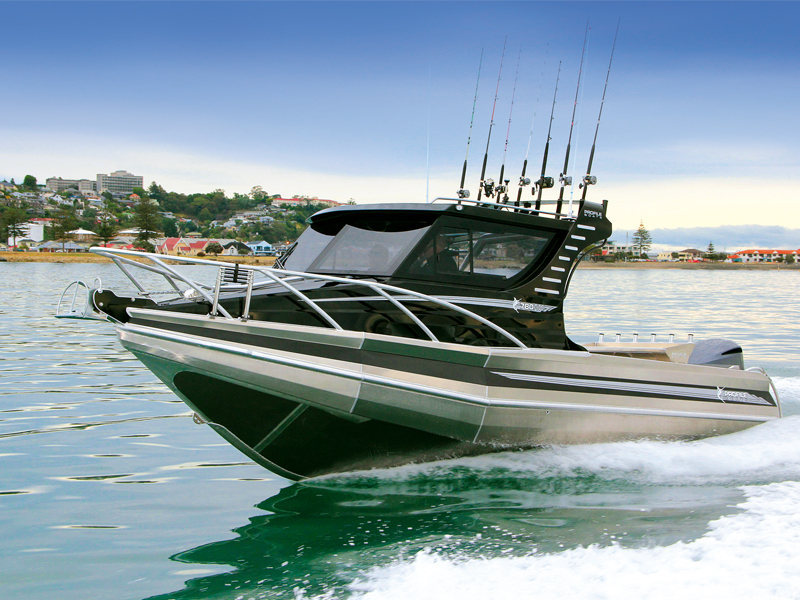 Set up for family fishing and cruising on Auckland’s Manukau Harbour, this latest example is equipped to a very high standard, reflecting the owner’s brief for a boat that will meet the requirements for overnight and weekend forays. As such, comfort is important and this has been delivered in spades. From the hot freshwater shower to the electric head, gas cooker and wetbar, sumptuous double seating and full-length berths, roughing it has no place in this owner’s vernacular. 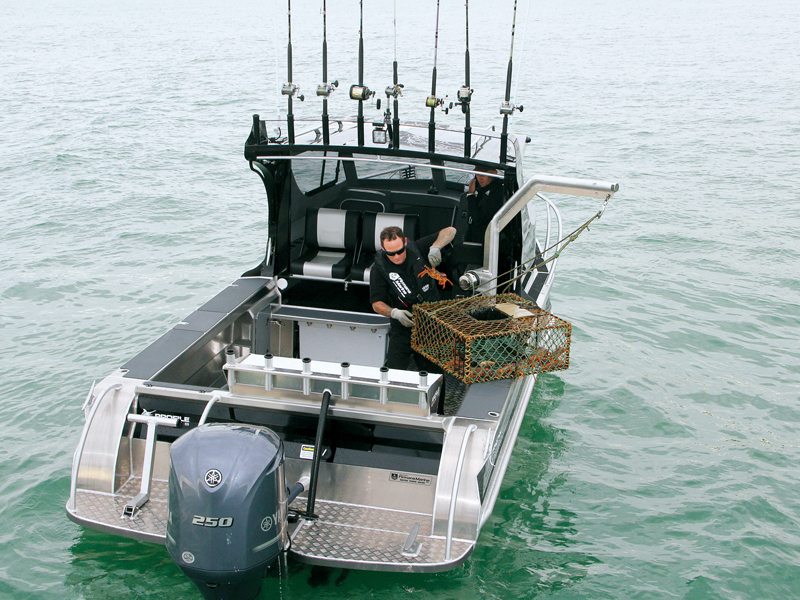 But for all of this, the boat’s primary purpose as a no-nonsense fishing platform has not been overshadowed. Everything you’d expect on a high-end trailerboat is just where you’d expect to find it, and includes a custom crayfish winch and boom, an enormous bait station and large glass-fronted livebait tank set into the transom. The 780HW’s construction is well engineered and executed, and centres on the boat’s four very substantial box-section alloy bearers and fully welded transverse frames and gussets. This creates three fully independent sealed underfloor sections capped by the 4mm chequerplate floor. The 780 hull uses a mix of 6mm plate for the hull and transom, 4mm topsides and 3mm pontoons. The pontoons are fabricated in three sealed sections, providing reserve buoyancy approaching 1000kg. Built to New Zealand survey requirements, the 780HW has been put into local commercial charter with a safety rating for nine passengers. The build quality is comparable to that of more established pontoon manufacturers, although the neatness of the welds in some places could be improved. Few welds are ground back, the builders preferring uncompromised strength over the lesser element of form. One very pleasing element was to note Profile’s use of external mounting brackets fabricated to the transom to mount transducers and trim tabs, reducing any risk of water ingress or long-term corrosion. Aesthetically speaking, the 780HW is extremely sharp and stylish with quality two-pot paint systems and striking graphics. At nearly 8m overall, it is big enough to avoid the boxy looks of some aluminium pontoon boats, while the hardtop superstructure is well proportioned to the topsides and overall dimensions of the boat. Clever use of space is a feature of the 780HW and smart touches and design features abound. Chief among these is the centrally mounted aft bait station that is fabricated as a part of the build process. This station dominates the transom real estate but allows two anglers to bait-up simultaneously or fillet and prepare their catch on the large and stable station. Mounted within this is a retractable drawer with various compartments for tackle, knives, lures and whatever else you might need at hand. Practicalities include a six-gang aft rodholder, taking the total number of holders spread across the cockpit coamings and overhead rocket launcher to 18. Transom access on this particular boat is a little challenging given the owner’s decision not to have a walk-through transom, preferring instead the security of a full-width transom across the entire rear of the cockpit. Fortunately, the 780 has one of the widest boarding platforms in its class. This affords divers the space required to remove tanks and gear without first having to hurdle over the transom. The cockpit proper is broad and long, without any unnecessary clutter. The chequerplate sole is solid underfoot and the cockpit coamings are wide and comfortable. Solid full-length rod racks are tucked well under the coamings and provide a sure footing when stepping from cockpit to deck. 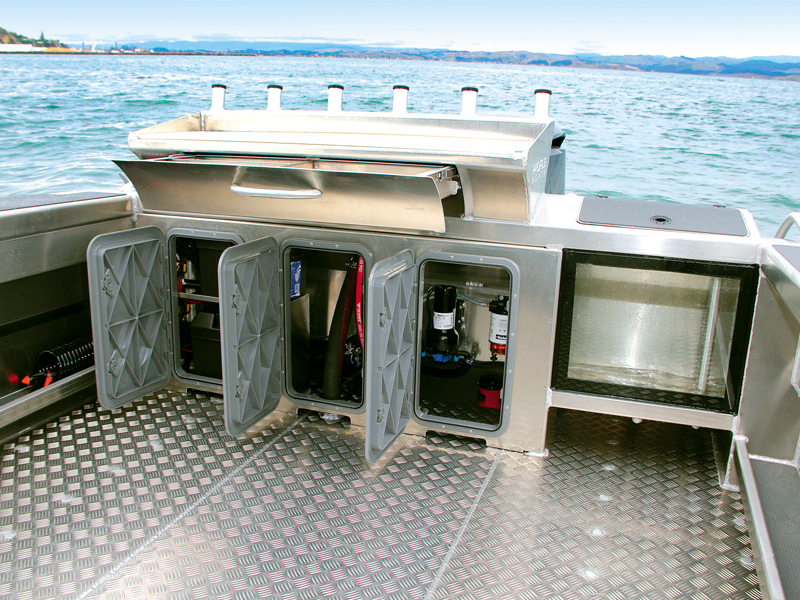 The inside transom carries three sealed hatches for convenient access to the boat’s house and start batteries, centrally mounted bilge pump, fuel filters, and ancillary plumbing for the bait tank and washdown pumps. Moving forward and to port you’ll find another access hatch built into the coaming. This houses the gas water heater for the overhead cockpit shower. Immediately forward again are the twin reversible passenger bucket seats, mounted well off the sole on a solid plinth that hinges forward. The reversible function of these seats allows passengers to face forward and enjoy the protection of the hardtop or alternatively face the cockpit. Hinge the whole unit forward and you’ll find a single-burner hob and a small wetbar and sink with a little utility cutting board alongside. While not large, it provides the capability to boil a kettle, wash dishes and prepare simple one-pot meals. Among the owner’s requirements was a pot-hauler boom with winch. This is securely mounted to the starboard coaming and cockpit sole, and swings out and overboard. The electric winch is mounted to the boom for a tidy and compact installation. The 780HW hardtop and helm station is thoughtfully laid out to maximise storage and create easy passage through to the fully lined forward cabin which provides comfortable overnight accommodation for two, and has an electric head secreted under the central cabin infill. Storage abounds under the berths and is supplemented with side shelves. The hardtop is well insulated and neatly finished, effectively reducing glare through the split safety glass windscreen. The five-spoke helm falls comfortably to hand, with a generous dash layout that in this case carries a 10in Lowrance touchscreen multifunction display and a trio of Yamaha digital engine gauges above. 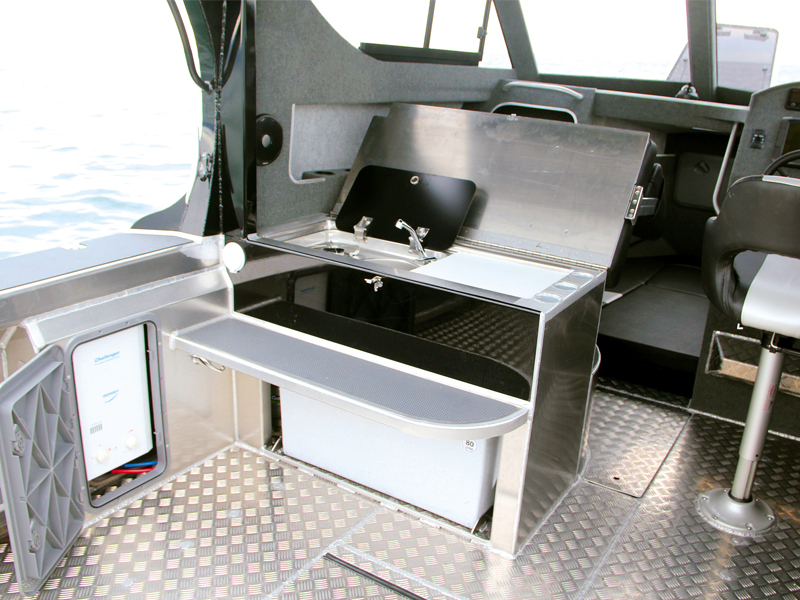 The boat’s primary switch panel is within easy reach and there is ample room for further flush-mounted instruments if required. Helm visibility is good and there is adequate ventilation from the half-opening side windows. The soft riser helm seat is well positioned for sitting or standing and the foot brace beneath is wide and solid. Moving around underway is secure with overhead and side rails where you need them. Rated for 200 to 350hp, the 250hp Yamaha four-stroke fitted was ideal, delivering an equal measure of performance and economy, while providing a useful range from the 265L underfloor fuel tank. Our sea trial had been compromised by two days of persistent wind and rain which robbed Profile’s technicians of valuable time on the water, setting up engine height and experimenting with different propellers. In the event, the 15in Salt Water series prop fitted wasn’t quite right for this boat, with a 17in alternative looking a better bet. Regardless, the big 250hp Yamaha made light work of the 780HW and pushed her to 34kt at WOT. Planing speed is easily achieved at about 10kt and holeshot performance is lively. With rain looming and poor early morning light, we restricted our test to a short run out to check Brian Firman’s crayfish pots off the Napier foreshore and a half-hour jolly on a lazy 1m swell in very light conditions. The big 780HW felt solid and willing, answering her hydraulic helm with just enough weight to be firm but comfortable. The ride is predictable and there are no obvious handling vices when pushing the boat hard into tight, spiralling turns. The moderate 18° deadrise hull is highly responsive to trim adjustments and flattens out nicely early into the rev range. This should deliver a comfortable and relatively stable platform at lower trolling speeds. At speed, the primary wash is expelled reasonably well aft and doesn’t tend to drum on the pontoons. Similarly, noise levels within the open hardtop are not excessive and there were no obvious rattles or vibrations to speak of. The internal helm station layout proved practical underway and there is nothing awkward about moving through the boat at speed. All in all, the Profile 780HW lives up to its promise as a capable and practical large trailerboat. Its size gives it excellent versatility as either a recreational fishing craft or a small commercial workboat. Its aesthetics and style put it squarely at the top of its class in the pontoon genre – it is little wonder Profile Boats is gaining traction and winning awards. See the full version of this review in Trade-A-Boat #492, June 2017. Why not subscribe today?